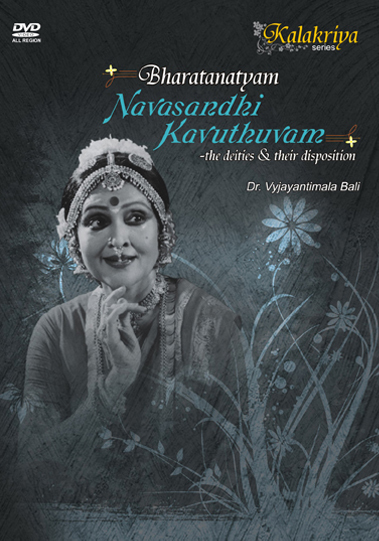 HereDr.vyjayantimala Bali, the legendary Bharatanatyam exponent treats the viewers to the nuances of Navasandhi Kavuthuvam, a traditional item long forgotten and rarely performed on stage these days. She describes in detail how this piece, performed as a part of the temple festival in the olden days for propitiating the deities ruling the nine directions or junctions, provides sample scope for a dancer. If fluidity marks her movements during the recital, coherence rules her explanation that precedes each recital. In her inimitable style, she outlines the personality and proclivity of each deity besides discussing the overall structure with the sahitya, madras and jathis that go with each kavuthuvam. She employs the most authentic techniques from her rich Bharatnatyam vocabulary to create an aesthetic experience that will delight students and lovers of classical dance no end.